Scuzzball sure has lost a lot of friends, hasn't he? 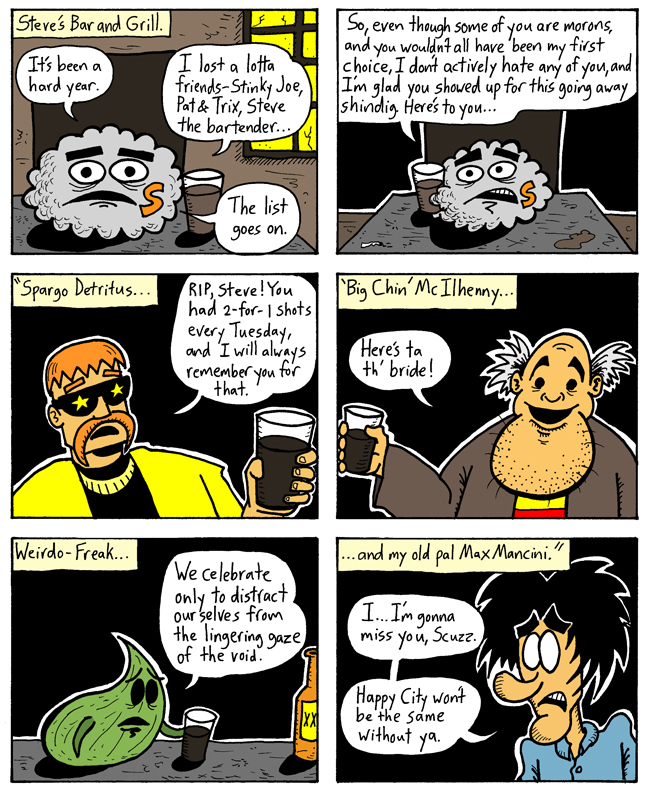 Stinky Joe and Pat & Trix were mentioned here, in the first new F&S comic of The Modern Era*. Steve the bartender was killed by Michael of the Love People, and we saw that here. Spargo Detritus and "Big Chin" McIlhenny both debuted back in episode 192. That one also saw the debut of Malev'lynn and Sister June in The Modern Era; both of them went on to play important roles in the Hell Hath Lots of Fury storyline. Max hasn't been seen in a long time, not since episode 152, but he's Scuzzball's best friend. NEXT WEEK: Max has an apology to make!